, an English poet and miscellaneous writer, the son of h clergyman beneficed in Lincolnshire, was born at Kirkby Steven, in Westmoreland, in. the month of March 1735, His father dying when he was only four years of age, the care of his education devolved on his mother, who initiated him in the first principles of knowledge with such tender anxiety as left a pleasing and indelible impression on his memory. He celebrated her virtues on her tomb, and more particularly by a beautiful monody inserted among his poems. 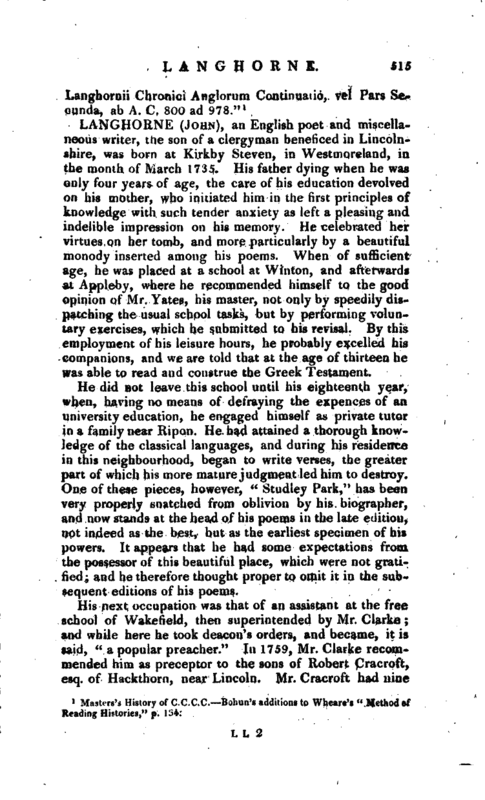 When of sufficient age, he was placed at a school at Winton, and afterward* at Appleby, where he recommended himself to the good opinion of Mr. Yates, his master, not only by speedily dispatching the usual school tasks, but by performing voluntary exercises, which he submitted to his revisal. By this employment of his leisure hours, he probably excelled his companions, and we are told that at the age of thirteen he was able to read and construe the Greek Testament. He did not leave this school until his eighteenth year, when, having no means of defraying the expences of an university education, he engaged himself as private tutor in a family near Ripon. He had attained a thorough knowledge of the classical languages, and during his residence in this neighbourhood, began to write verses, the greater part of which his more mature judgment led him to destroy. One of these pieces, however, “Studley Park,” has been very properly snatched from oblivion by his biographer, and now stands at the head of his poems in the late edition, nbt indeed as the best, but as the earliest specimen of his powers. It appears that he had some expectations from the possessor of this beautiful place, which were not gratified; and he therefore thought proper to omit it in the subsequent editions of his poems. His next occupation was that of an assistant at the free school of Wakefield, then superintended by Mr. Clarke; and while here he took deacon’s orders, and became, it is said, “a popular preacher.” In 1759, Mr. Clarke recommended him as preceptor to the sons of Robert Cracroft, esq. of Hackthorn, near Lincoln. 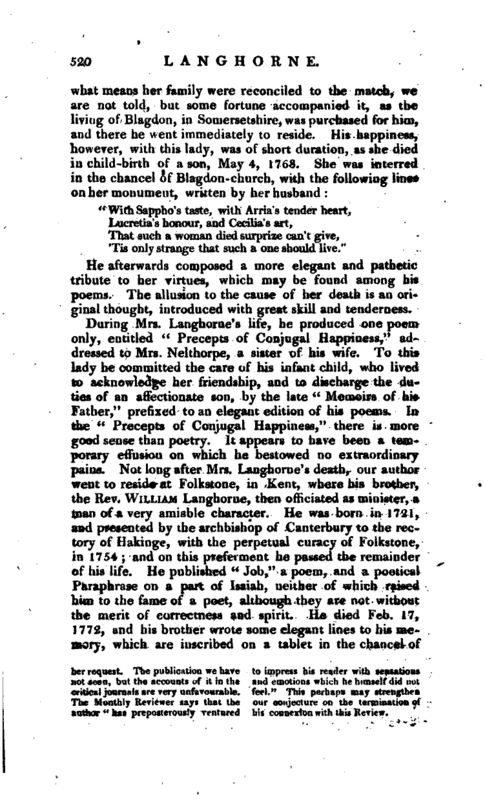 Mr. Cracrdft had nine | sons, and Mr. Langhorne must have been fully employed in the family; yet he added to theirs the tuition of Mr. Edmund Cartwright, a young gentleman of a poetical turn, who afterwards published an elegy, entitled “Constantia,” on the death of his preceptor’s wife. During his residence at Hackthorn, our author published a volume of his poems, for the relief of a gentleman in distress; and in the same year a poem, entitled “The Death of Adonis,” from the Greek of Bion. Public opinion gave him no encouragement to reprint this last, but he derived from it the advantage of being noticed as a critic of considerable acumen in Greek poetry. In 1760 he entered his name at Clare-hall, Cambridge, in order to take the degree of bachelor of divinity, which he supposed, by the statutes of the university, any person in orders is impowered to do without residence; but in this it is probable he did not succeed, as his name is not to be found among the Cambridge graduates. 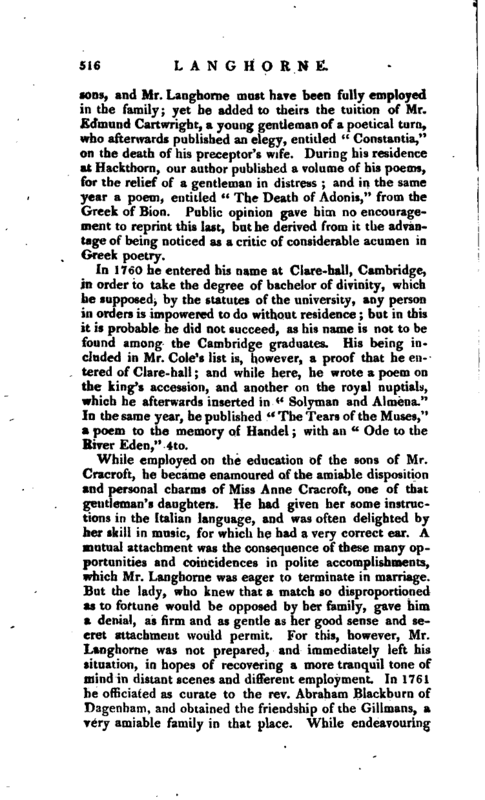 His being included in Mr. Cole’s list is, however, a proof that he entered of Clare-hall; and while here, he wrote a poem on the king’s accession^ and another on the royal nuptials, which he afterwards inserted in “Solyman and Almena.” In the same year, he published “The Tears of the Muses,” a poem to the memory of Handel; with an “Ode to the River Eden,” 4to. While employed on the education of the sons of Mr. Cracroft, he became enamoured of the amiable disposition and personal charms of Miss Anne Cracroft, one of that gentleman’s daughters. He had given her some instructions in the Italian language, and was often delighted by her skill in music, for which he had a very correct ear. A mutual attachment was the consequence of these many opportunities and coincidences in polite accomplishments, which Mr. Langhorne was eager to terminate in marriage. But the lady, who knew that a match so disproportioned as to fortune would be opposed by her family, gave him a denial, as firm and as gentle as her good sense and secret attachment would permit. For this, however, Mr. Langhonie was not prepared, and immediately left his situation, in hopes of recovering a more tranquil tone of mind in distant scenes and different employment. In 1761 he officiated as curate to the rev. Abraham Blackburn of :cnham, and obtained the friendship of the Gillmans, a very amiable family in that place. While endeavouring | to forget his heart’s disappointment, he found some relief in penning a “Hymn to Hope,” which he published this year in London, 4to; and in the course of the next, he gave further vent to his thoughts in “The Visions of Fancy, four Elegies,” 4to “Letters on Religious Retirement,” 8vo and “Solyman and Almena,” a fiction in the manner of the Eastern Tales, but not much to be praised for invention. The “Letters” are of a sentimental, melancholy cast, with a considerable mixture of lighter and more entertaining matter. In the same year he published “The Viceroy,” a poem in honour of lord Halifax, then lord lieutenant of Ireland. Here, as in the case of “Studley Park,” our author appears to have expected to find a patron, but lord Halifax did not condescend to notice what, it must be confessed, flatters him with too much artifice; and Langhorne, when he collected his poems, retained only a favourite fragment of this unlucky piece, omitting altogether the name of Halifax, or Viceroy. The whole, however, is given in the last edition of the “English Poets,” as originally written. His “Letters on Religious Retirement” were dedicated, with rather more success, to bishop Warburton, who returned a complimentary letter, in which he encouraged our author to make some attempt in the cause of religion. This is supposed to have produced, in 1763, “The Letters that passed between Theodosius and Constantia,” a fiction founded on a well-known story in the Spectator. The style of these letters is in general elegant, but in some parts too florid. The*“Letter on Prayer” is very equivocal in its tendency. This year also gave birth to a poem, meant to be philosophical, entitled “The Enlargement of the Mind,” part first, in which we find some noble sentiments expressed in glowing and elevated language. 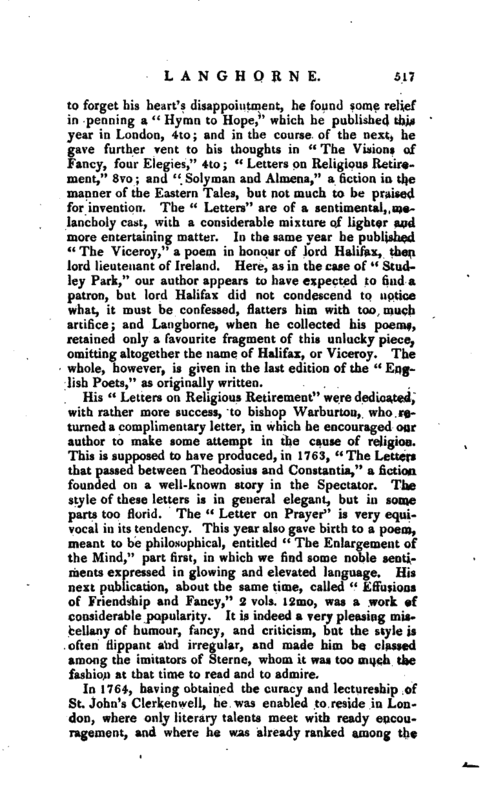 His next publication, about the same time, called “Effusions of Friendship and Fancy,” 2 vols. 12rno, was a work of considerable popularity. It is indeed a very pleasing miseellany of humour, fancy, and criticism, but the style is often flippant and irregular, and made him be classed among the imitators of Sterne, whom it was too much the fashion at that time to read and to admire. In 1764, having obtained the curacy and lectureship of St. John’s Clerkenwell, he was enabled to reside in London, where only literary talents meet with ready encouragement, and where he was already ranked among the | elegant and pleasing poets of the day, and had given antipie proof of ease and versatility in the choice and management of his subjects. 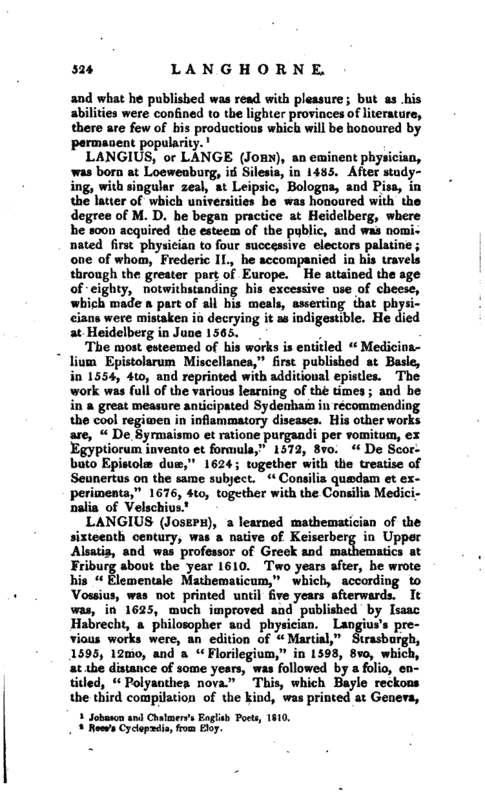 His first publication this year was a continuation of “Theodosius ami Constantia,” of much the same character as the former work, but enlivened by more variety. As he appears to have aspired to promotion through the popularity of his talents in the pulpit, he novr gave a specimen of what had pleased his congregation, in two volumes of “Sermons.” His biographer has taken some pains to defend these against the censure of the late Mr. Mainwaring of St. John’s, Cambridge, in his “Dissertation” prefixed to his Sermons, (1780). But it appears to us that they abound in the false pathos, and that the reasoning, where any occurs, is very superficial. They have, however, the advantage to those who dislike sermons of every kind, that they are perhaps the shortest ever published. About this time his son informs us that he engaged with Mr. Griffiths as a writer in the Monthly Review; and that this engagement, with scarcely any intermission, continued to his death. We suspect there is some mistake in this account, although the secresy which very properly prevails in the management of a Review, will not allow us to rectify it. 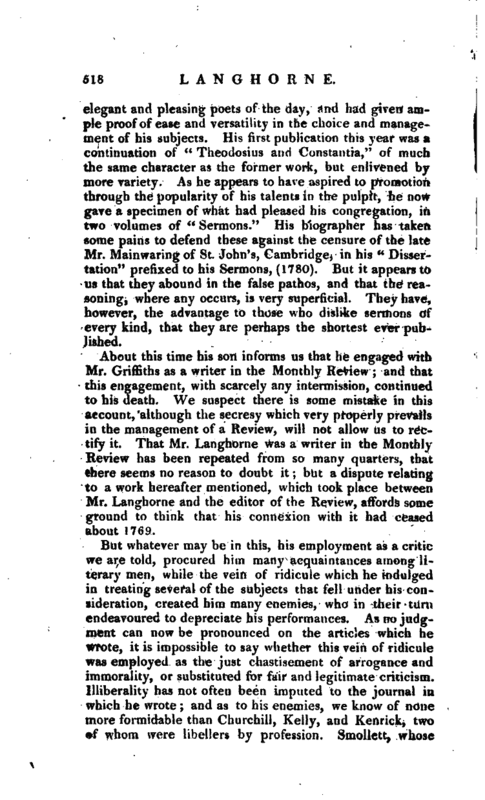 That Mr. Langhorne was a writer in the MonthlyReview has been repeated from so many quarters, that there seems no reason to doubt it; but a dispute relating to a work hereafter mentioned, which took place between Mr. Langhorne and the editor of the Review, affords some ground to think that his connexion with it had ceased about 1769. But whatever may be in this, his employment as a critic we are told, procured him many acquaintances among literary men, while the vein of ridicule which he indulged in treating several of the subjects that fell under his consideration, created him many enemies, who in their turn endeavoured to depreciate his performances. As no judgment can now be pronounced on the articles which he wrotCj it is impossible to say whether this vein of ridicule was employed as the just chastisement of arrogance and immorality, or substituted for fair and legitimate criticism. Illibefality has not often been imputed to the journal in which he wrote; and as to his enemies, we know of none more formidable than Churchill, Kelly, and Kenrick, two of whom were libellers by profession. 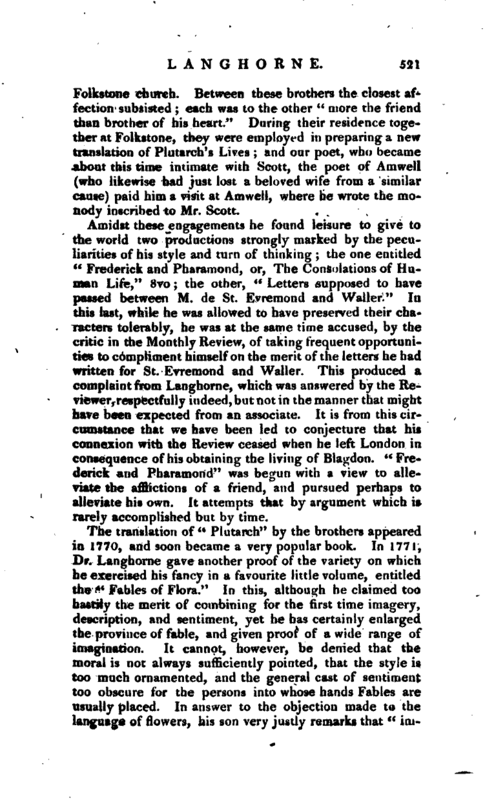 Smollett, whose | jealousy of the Monthly Review led him often to disgrace his talents by invidious attacks on the supposed writers belonging to it$ bestows almost uniform praise on Langhorne’s various works. 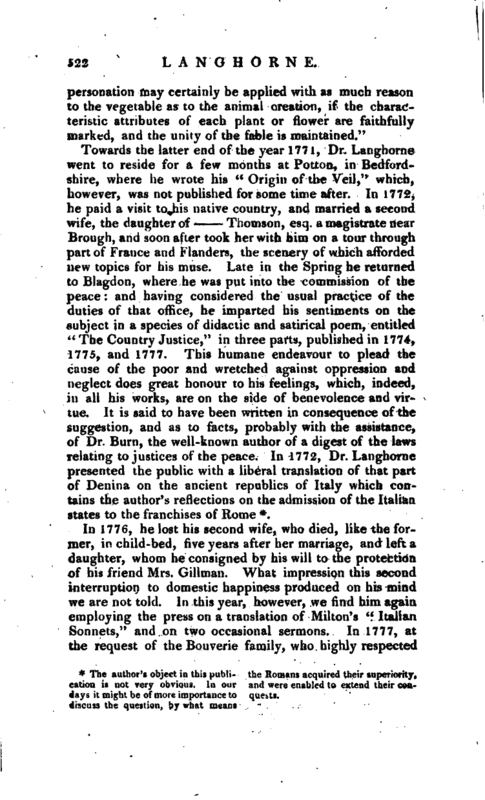 In 1765j his productions were, “The Second Epistle on the Enlargement of the Mind;” an edition of the poems of the elegant and tender Collins, with a criticism and some memoirs; and letters on that difficult subject, “The Eloquence of the Pulpit.” He had now occasion to exert his own talents before a more enlightened auditory than he had ever yet addressed, having been appointed by Dr. Hurd (bishop of Worcester) to the office of assistant preacher at LincolnVihn chapel. In the following year we do not find that any thing original came from his pen, He prepared for the press, however, an enlarged edition of hia “Effusions of Friendship and Fancy,” and a collection of his “Poems,” in 2 vols. 12mo. The principal article of these, not before published, is a dramatic poem, or tragedy, entitled ‘< The Fatal Prophecy." This was his only attempt in this species of poetry, and was universally accounted unsuccessful. He had the good sense to acquiesce in the decision, and neither attempted the drama again, nor reprinted this specimen. 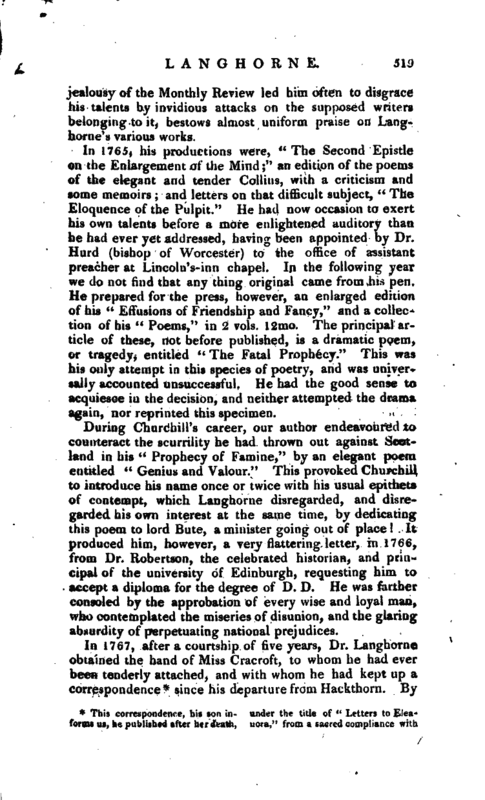 During Churchill’s career, our author endeavoured to counteract the scurrility he had thrown out against Scotland in his “Prophecy of Famine,” by an elegant poem entitled “Genius and Valour.” This provoked Churchill to introduce his name once or twice with his usual epithets of contempt, which Langhorne disregarded, and disregarded his own interest at the same time, by dedicating this poem to lord Bute, a minister going out of place It produced him, however, a very flattering letter, in 1766, from Dr. Robertson, the celebrated historian, and principal of the university of Edinburgh, requesting him to accept a diploma for the degree of D. D. He was farther consoled by the approbation of every wise and loyal man, who contemplated the miseries of disunion, and the glaring absurdity of perpetuating national prejudices. Tis only strange that such a one should live." He afterwards composed a more elegant and pathetic tribute to her virtues, which may be found among his poems. The allusion to the cause of her death is an original thought, introduced with great skill and tenderness. author ’ fcw preposterously vtnturcd his connexion with this Review. | Folkstone church. Between these brothers the closest affection subsisted; each was to the other “more the friend than brother of his heart.” During their residence together at Folkstone, they were employed in preparing a new translation of Plutarch’s Lives; and our poet, who became about this time intimate with Scott, the poet of Amwell (who likewise had just lost a beloved wife from a similar cause) paid him a visit at Aniwell, where he wrote the monody inscribed to Mr. Scott. Amidst these engagements he found leisure to give to the world two productions strongly marked by the peculiarities of his style and turn of thinking the one entitled “Frederick and Pharamond, or, The Consolations of Human Life,” 8vo the other, “Letters supposed to have passed between M. de St. Evremond and Waller” In this last, while he was allowed to have preserved their characters tolerably, he was at the same time accused, by the critic in the Monthly Review, of taking frequent opportunities to compliment himself on the merit of the letters he had written for St. Evremond and Waller. This produced a complaint from Langhorne, which was answered by the Reviewer, respectfully indeed, but not in the manner that might have been expected from an associate. It is from this circumstance that we have been led to conjecture that his connexion with the Review ceased when he left London in consequence of his obtaining the living of Blagdon. “Frederick and Pharamond” was begun with a view to alleviate the afflictions of a friend, and pursued perhaps to alleviate his own. It attempts that by argument which is rarely accomplished but by time. The author’s object in this publication is not very obvious. In our days it might be of more importance to discuss the question, by what means the Romans acquired their superiority, and were enabled to extend their coutry. In 1776, he lost his second wife, who died, like the former, in child-bed, five years after her marriage, and left a daughter, whom he consigned by his will to the protection of his friend Mrs. Gillman. What impression this second interruption to domestic happiness produced on his mind we are not told. In this year, however, we find him again employing the press on a translation of Milton’s “Italian Sonnets,” and on two occasional sermons. In 1777, at the request of the Bouverie family, who highly respected | Mr. Langhorne, Dr. Moss, bishop of Bath and Wells, presented him with a prebend in the cathedral of Wells. His last production was the tale of “Owen of Carron;” which, with some beauties, has less of his usual energy and vigour; it is uncertain whether this was owing to the nature of the poem, in which he conceived it necessary to imitate the ballad simplicity, or to a languor of body and mind. 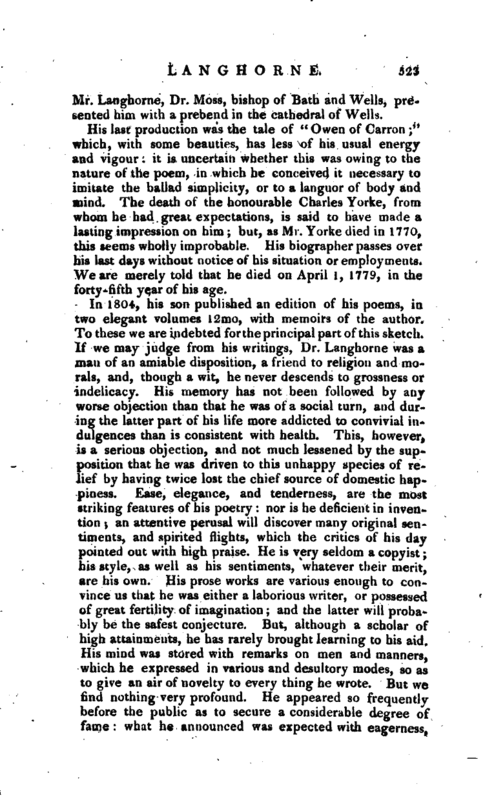 The death of the honourable Charles Yorke, from whom he had great expectations, is said to have made a lasting impression on him; but, as Mr. Yurke die-i in 1770, this seems wholly improbable. His biographer passes over his last clays without notice of his situation or enjoyments. We are merely told that he died on April i, 1779, in the forty -fifth year of his age. Johnson and Chalmers’s English Poets, 1810.